This is a page listing of all the RPG Maker comics made by Yanfly that talk about game design. Let’s go together on a journey with Yanfly, FlyingDream, and Ralph to make an RPG Maker game while learning several tips and tricks on the way! Ralph’s been having the blues about creating a game. A game that he’s been working on for quite the while. Yet, he feels like he couldn’t get anywhere. Learn about how to make a basic game structure in a barebones format to facilitate the creation of one's RPG Maker game easier! Ralph’s quest to make a game continues. 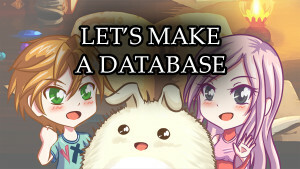 This time, he encounters one of his greatest foes: the database! Learn ways to save time, maintain balance, and keeping organization within the database. Ralph is about to make a dungeon, but he doesn’t know where to even start. And as always, he goes to Yanfly and FlyingDream for help! Learn ways to design a dungeon, the floor plan, and the monsters to go with it!